Combining the old with the new, the traditional with the contemporary in music is no mean feat. 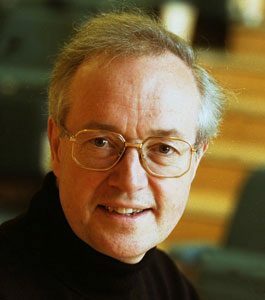 But for Stephen Cleobury, Director of Music of the Choir of King’s College, Cambridge, this is an essential element of remaining at the forefront of choral singing in an ever-changing world. 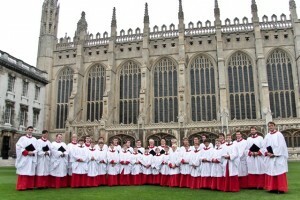 Whilst he and the choristers of this world-famous choir sing daily in the beautiful chapel of King’s College at Cambridge (a splendid example of late Gothic architecture which goes back to the 15th century), surrounded by some of the finest medieval stained glass in the world, Cleobury is determined that the choir will not remain couched in the past. 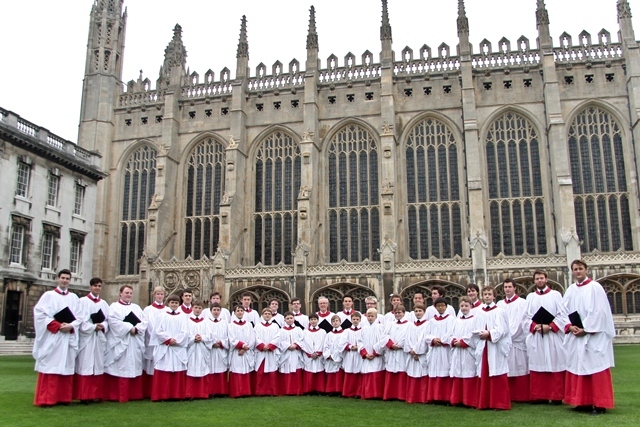 Although the choir was formed under the patronage of King Henry VI, the purpose being to sing the daily services in the chapel, the choir today has a world-wide reputation as being at the forefront of choral performance, with a recording output in the dozens, numerous overseas tours, as well as performances in London and elsewhere in the UK. As director, Cleobury has seen enormous change. Adhering for the most part to its traditional tenents, Cleobury, himself is responsible for much of this shift, most notably to the singing of new repertoire by living composers. “When I came to King’s in 1982, one of the very big tasks that lay before me was the Festival of Nine Lessons and Carols, which is probably the occasion in the year when we’re heard by a large number of people across the world. This, of course is a very traditional event, but in my opinion it is important to nourish it with new music, so that it doesn’t become a museum piece,” said Cleobury. 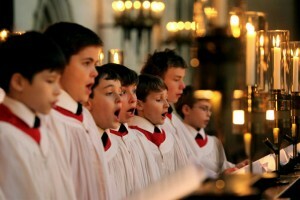 Indeed, the choir’s worldwide reputation hinged to a large extent on the annual broadcast of this very Festival of Nine Lessons and Carols (heard by tens of millions of people). The first composer to be commissioned was Lennox Berkeley, and amongst those who have followed him are, Thomas Adés, Judith Bingham, James Macmillan and John Rutter, to name but a few. Cleobury acknowledges that each of these composers, Peter Sculthorpe, Carl Vine and Brett Dean are very well known in Europe and in the UK. Australian composer Carl Vine wrote the carol for the 2012 service, Ring Out, Wild Bells, based on a setting of Tennyson’s poem. For Vine, the poem “inventively encapsulates the core Christian principles of community, generosity and kindness”. 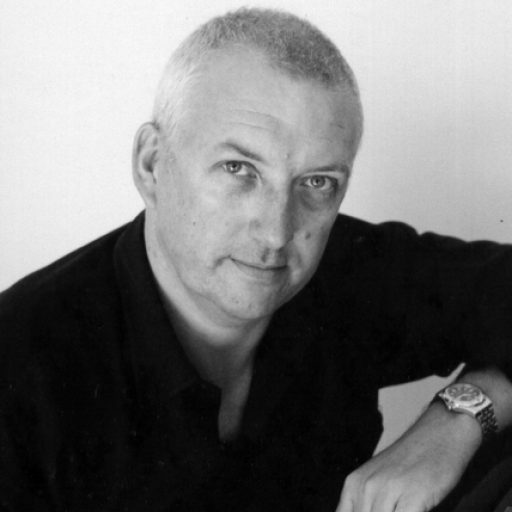 The commission for the Festival in 2007 went to Brett Dean and his composition, Now Comes the Dawn uses a poem by Richard Watson Gilder. Peter Sculthorpe’s The Birthday of thy King was the first Australian carol to be commissioned and included in the famous Festival. Dating back to the late 1980s, the carol commission came about simply as Cleobury was very fond of another Sculthorpe carol, Morning Song for the Christ Child, and he felt he would really love another piece by the iconic Australian composer. Cleobury is proud of the fact he has enacted change and endured the storm of controversy over the introduction of new (or modern) pieces to the choir’s repertoire. Cleobury admits that it has been quite a nice journey and although he received some pressure in the early days from publishers, things have changed even there. Nowadays, as the tradition of the annual commission has become better known, publishers will write in with suggestions, but Cleobury confesses that he hasn’t got a list of the 25 most famous contemporary composers, and that he puts them in some order and works through the list. From singing at the Chapel of King’s College, Cambridge to such renowned concert venues as the Royal Albert Hall in London, and the Sydney Opera House, the choir must manage carefully the variances of hall, and even performing in front of a concert audience. The choir’s sixteen boy choristers, aged between nine and thirteen years, fourteen male undergraduates, and two organ scholars, has become quite adept at touring. Noting that there are real differences between singing in the Chapel for a service, where the purpose is for the music to elevate the liturgy, and the concert platform, where the choir sings directly to an audience, Cleobury claims he doesn’t make massive changes when singing in a new venue, but rather reacts sensitively to the acoustical spaces he encounters. “There are two things I keep telling the choir when I get into a concert venue: if it is a really big venue, such as the Opera House, you mustn’t think that you have to sing 2 or 3 times more loudly to fill the space. You lose all sorts of things, like blend and quality. We do quite a number of concerts in the Royal Albert Hall in London, and the truth is that soft singing carries rather well in that acoustic. The second point is to make sure you are singing a sostenuto line as there is no King’s College acoustic to carry if you are not. There are two programmes on offer in Sydney. A mixture of early English and Italian pieces sit alongside nineteenth and twentieth century English works, and in one concert, Fauré’s timeless and touching Requiem, accompanied by the College’s Organ Scholar. (Britten) and Requiem in D minor, Op 48 (Fauré). (Stanford), and Hymn to St Cecilia, Op 27 (Britten). On this Australian tour, the choir and Dr Cleobury are not only presenting a feast of the finest choral music, but also nurturing a tradition which has been inherited from the fifteenth century, all the while straddling the twentieth century with the inclusion of music of the present day. The profound poetry of American, Emily Dickinson (1830-1886) is fertile ground for expressive musical treatment. Aaron Copland (1900-1990) visited Dickinson’s New England home, and through his research gained much insight into the reclusive poet. He was considered to be the only person who really understood her thoughts, and could marry her words with music. This live recording contains eight songs, which mostly deal with some aspect of death. (The poems, which Copland set, were Nature the gentlest mother, There cam a wind like a bugle, The world feels dusty, Heart we will forget him, Dear March come in, Sleep is supposed to be, Going to Heaven, and The Chariot.) The morbidity of the poems combined with Copland’s incredible orchestral colouring is given an intense tonal hue by both singer and orchestra that is both compelling and haunting. Acclaimed Australian soprano, Emma Matthews shows her technical and artistic skill in interpreting these poems with a poignant nuance, as she delves into the richness of the text. For many, Copland is the authentic American voice, and in Appalachian Spring, that essence is captured: the wide-open skies, the pioneering spirit and values of simplicity. Collaborating with choreographer Martha Graham, Copland produced the music for a ballet, which explored themes of solidity, sobriety, industriousness, family, and community spirit. It effectively conjures sounds connected with Puritan values (particularly in the use of the tune Simple Gifts) during this time of Revivalist and Shaker influence. The music is so quintessentially American, full of “the wide-open folksy breeziness, the stoic heroism of melodies constructed starkly from fourths, (and) the simple colours of the orchestration”, writes Gordon Kalton Williams. This disc forms part of the successful MSO Live series, and was recorded in concert at the Arts Centre (Hamer Hall) in June 2013. 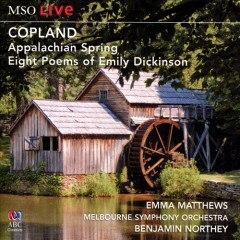 A perfect coupling of two Copland works, the MSO, under the direction of Benjamin Northey, creates superbly a colourful, and at times sparkling performance, imbued sympathetically with an emotional core.